Fort Lee, NJ, September 3, 2015 / PRNewswire / – Pioneer Power Solutions, Inc. (Nasdaq: PPSI) (“Pioneer” or the “Company”), a company engaged in the manufacture, sale and service of electrical distribution and on-site power generation equipment, including paralleling switchgear, has launched a new line of self-protecting Automatic Transfer Switches (ATS). The new ATS line is highly suitable for applications on both critical and non-critical loads. The new product is available in 3 models covering a range of 400-2000A at 65 or 100kAIC (600V) in 3 or 4 pole configurations. Boasting integral overcurrent protection and optional draw out functionality makes the switch ideally suited for UL Service Entrance applications by eliminating the need for additional circuit protection. Draw-out construction also allows quick replacement of the switch with little or no downtime, for ease of maintenance. The source device not feeding the load can easily be removed for inspection, maintenance and testing. The on-board electronic trip units provide performance curve shaping to facilitate proper system coordination. Optional arc flash maintenance trip units can be provided to meet the requirements of NEC 240.87 (2014) for Arc Energy Reduction. These trip units are designed to reduce the potential hazard from an arc flash during maintenance. Completely enclosed contacts provide additional safety when working with the switch. Manual, open, delayed, closed, and soft loading (active synchronization) transition. 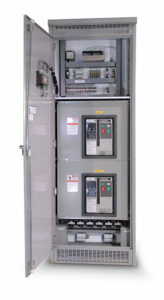 Service Entrance Manual Transfer Switch in NEMA 3R with Cam-Lok™ Connectors for roll-up generator stand-by applications. Can be integrated (in-house) with metering & distribution switchboard sections, providing a compact space savings arrangement, minimizing contractor installation time and expense. Pioneer’s state of the art non-proprietary, easy to interface, controller with graphic display satisfies a broad range of application requirements, from simple to complex. In addition to normal source monitoring (1 or 3 phases) for under voltage, over voltage, under frequency, over frequency and voltage unbalance, the InteliATS PWR controller includes true voltage & current RMS measurement, test run scheduler, 3 phase power measurement, detailed RTC event & performance log (119 records), Web Supervisor support and 7 binary inputs & outputs. The InteliATS PWR controller also supports a wide variety of communication options for connection to the existing Building Management or SCADA system. For additional information please contact Vince Visconti, General Manager – Strategic Sales Group, at 704.784.8345, or at vince@pioneerpowersolutions.com .